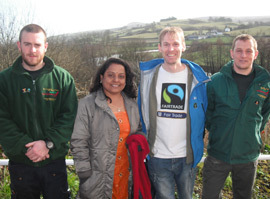 llandeilo primary school and ammanford nursery school both walked fair trade ways around their local co-ops yesterday, finding loads of products with the fairtrade mark. Saturday 3rd March : I woke in the night to the sound of rain, and felt like a sad holidaymaker in a damp tent! But sunshine mixed with showers while we were on the bus into Swansea… and then there was only sunshine on the walk! It may be because our walk was featured in The Salvation Army’s War Cry newspaper that morning, but it did seem that God was on our side! We also like to think that Swansea Council are on our side, and they have been very supportive in lots of ways… but it does seem that, despite frequent reminders, the café at the County Hall which claims to be a Fairtrade café does not actually seem to have any Fairtrade tea or coffee available to purchase! One thing we chatted about on this Fairtrade Meeting On The Move was the way that sometimes, after Town/City status has been achieved, things slip away as the focus moves off campaigning for cafés to stock Fairtrade. An important role these Ways can have is to help monitor, reinvigorate and inspire outlets. 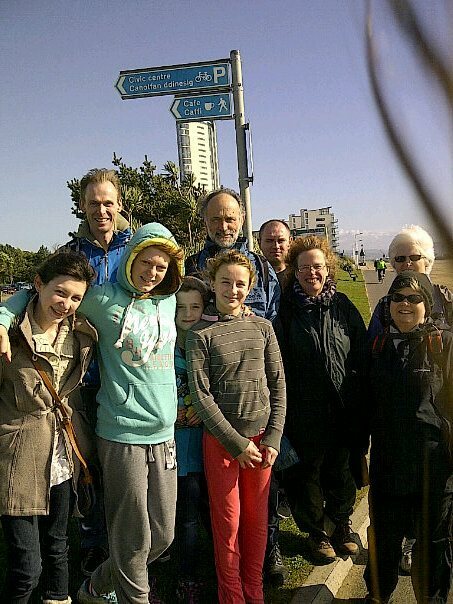 We took a photo of us on the prom by the sign to the council café… and here it is to show you which way to go to ask them to stock fairtrade. We also discovered a nice alternative ending for the Way, if The Red Café is closed (It generally only opens in school holidays or for events) : The Kitchen Table, just a few doors down, is a lovely little cafe promoting fairtrade, organic and local. On the way home we stopped at The Vetch, which used to be Swansea City’s ground, and has now been developed into community allotments as part of the Cultural Olympiad. vetchveg.tumblr.com They had just built a canteen area. I will be down soon with Fairtrade Tea and Coffee! 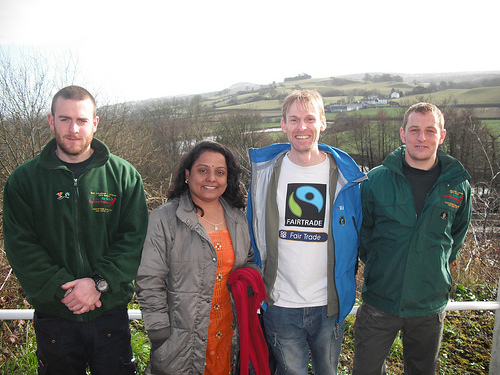 On February 29th, Walking for Health sponsored a Fair trade walk from Chapter Arts Centre in Canton. We were all very thankful for the brilliant weather and all of the Spring flowers already blooming in Thompsons Park and Victoria Park for us to enjoy! 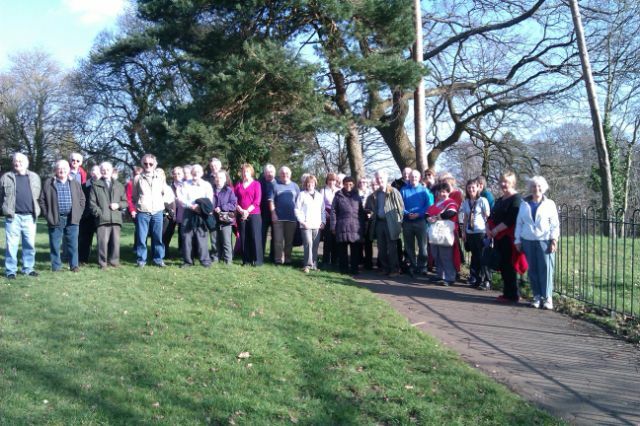 There were 45 people on the walk and we all enjoyed the mix of parks and urban streets with the sun shining.